For the individual settlement, see Dudley. The Metropolitan Borough of Dudley is a metropolitan borough of West Midlands in England. It was created in 1974 following the Local Government Act 1972, through a merger of the existing Dudley County Borough with the municipal boroughs of Stourbridge and Halesowen. The borough borders Sandwell to the east, the city of Birmingham to the south east, Bromsgrove to the south in Worcestershire, South Staffordshire District to the west, and the city of Wolverhampton to the north. 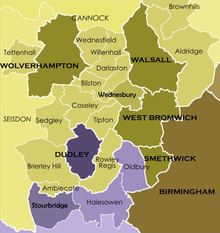 Being a metropolitan borough Dudley is effectively a unitary authority, with the exceptions of Transport for West Midlands, (publicly branded as Network West Midlands), fire and police services, and the local government pension fund (West Midlands Pension Fund), which are jointly run by the seven metropolitan boroughs of the West Midlands county. For Eurostat purposes, Dudley is a NUTS 3 region (code UKG36), and is one of seven boroughs or unitary districts that comprise the "West Midlands" NUTS 2 region. The Metropolitan Borough of Dudley was created in 1974 from the existing boroughs of Dudley, Stourbridge and Halesowen. This followed an earlier reorganization in 1966, as per the provisions of the Local Government Act 1958, which saw an expansion of the three boroughs from the abolition of the surrounding urban districts of Amblecote, Brierley Hill, Coseley, and Sedgley; and the municipal boroughs of Tipton, Oldbury, and Rowley Regis. Initially the borough had a two-tier system of local government, with the borough council sharing power with the West Midlands County Council. In 1986 metropolitan county councils were abolished under the Local Government Act 1985, and Dudley effectively became a unitary authority. Dudley Council has its main offices in Dudley town centre (where the council house is located), along with additional smaller offices throughout the borough. The council is made up of 72 councillors representing 24 wards, and as of the 2016 local government elections, has no party with overall control. The political make-up is as follows: The 2018 election left Labour and the Conservatives tied on 35 seats each, but the Tories re-took control of the council when the last remaining UKIP member defected to the Conservatives. In the time since, one Conservative councillor in the Norton ward has defected to the Labour Party, which means control of the council could quite easily change yet again. On its formation in 1974, the Metropolitan Borough of Dudley was controlled by the Labour Party, who lost control to the Conservatives in 1976. From 1980 to 1982 and again from 1984 to 1986, there was no overall control of the council, with the Conservatives regaining their majority in 1982 before losing it again in 1984. Labour won overall control of the council in 1986 and held it until 1992, when the Conservatives briefly controlled the council with a majority of one, before losing control back to Labour the following September. Then came a nine-year run of Labour overall control which ended in 2003, when no party had overall control and the Conservatives led a minority administration. In 2004, the Conservatives gained control of Dudley MBC and held it for eight years before losing control to Labour. In 2016, Labour lost control of the council, and formed a minority administration - supported by UKIP, which lasted until 2017 when the Conservatives, again supported by Ukip, took over the leadership of the authority. The 2018 local elections left the Conservatives and Labour tied on 35 seats, but the Conservatives regained control shortly after when the authority's only remaining UKIP councillor defected to the Tories. At the 2011 Census, the total population of the Dudley Metropolitan Borough was 312,925, an increase of 7,770 from the last census; making it the 25th largest government district in England. The population density was 31.9 people per hectare. 90.4% of Dudley's population identified as White, with 88.7% identifying as White British, 0.5% as White Irish, and 1.2% as Other White. The second largest ethnic group was Asian and British Asian, making up 5.6% of the population. Black and Black British people comprised 1.7% of the population of the borough. Statistics on religious beliefs show that 65.3% of the population identify as Christian, with the second largest religious group being Muslim, at 4.1%. 22% identified as having no religion, while 6.2% did not state a religious belief. Unemployment in the borough stood at 5.3%, slightly higher than the national average of 4.4%. Of those in the population considered economically active, 38.2% were in full-time employment, 15% were in part-time employment, 7.5% were self-employed, and 2.5% were in full-time education. Of those economically inactive, 16.2% were retired, 4.6% were looking after homes or family, 4.4% were long-term sick or disabled, and 4.3% were full-time students without employment. A part of the Black Country, Dudley traditionally has been an industrial centre of manufacturing, quarrying, and mining, although this has declined in more recent years, with a shift in focus towards the service sector (accounting for 79.1% of employment) and tourism. Despite this, there are still numerous large industrial sites around the borough, such as the Pensnett Trading Estate, with the manufacturing industries making up 15.3% of employment. Tourism is of increasing importance to the local economy, with approximately 6,600 people employed within the sector. Attractions such as the Black Country Living Museum and Dudley Zoo bring in hundreds of thousands of visitors each year. The Merry Hill Shopping Centre in Brierley Hill is one of the largest shopping centres in the UK and is the main retail centre of the borough, with an average of 23.5 million visitors a year, and houses branches of several large retailers including Debenhams, Marks & Spencer, and Next. Other large employers in the borough include JCDecaux UK, which has its Birmingham area office in Halesowen, Rentokil Initial, and Midtherm Engineering. Large public and private sector developments have taken place in the Metropolitan Borough of Dudley since its creation in 1974. The closure of Round Oak Steelworks in December 1982 paved the way for the creation of the Merry Hill Shopping Centre on nearby farmland between 1985 and 1989. The Waterfront leisure and commercial complex was developed on the site of the steelworks itself between 1989 and 1995. Pensnett Trading Estate in Kingswinford has been developed since the 1960s for mostly light industry and services. A major redevelopment of Halesowen town centre took place in 2007/08, when the bus station was rebuilt and a section of the 1960s shopping area demolished to make way for a new Asda superstore. A similar redevelopment of Stourbridge town centre in 2011/12 saw most of the Crown Centre completely rebuilt to incorporate a new Tesco superstore. Relatively little new council housing has been built in the borough since the early 1980s, with almost all of the new social housing developments since then being built by housing associations. Most of the older private housing in the borough has been renovated rather than demolished during this time. However, there have been a number of redevelopment programmes involving 20th century council housing. In July 1999, four of the borough's tower blocks (two at Eve Hill in Dudley and two at Tanhouse in Halesowen) were demolished on consecutive weekends in controlled explosions. Two years later, two more tower blocks at Queens Cross in Dudley were demolished using the same method. Four tower blocks in Netherton are scheduled for demolition in 2017/18. In 2009, 266 homes on the predominantly 1930s Priory Estate in Dudley were demolished and the land later redeveloped with new housing. In the mid 1990s, the neighbouring Wren's Nest Estate underwent extensive refurbishment as well as improved community facilities in a multimillion-pound project funded by the European Single Budget. Four blocks of low-rise flats on the estate were demolished as part of the regeneration. There are three further education colleges in the Dudley Borough: Dudley College of Technology, Halesowen College, and Birmingham Metropolitan College (formerly Stourbridge College). The borough is also home to the King Edward VI sixth form college in Stourbridge, originally a grammar school established in 1552, converting to a sixth form centre in 1976. A small number of secondary schools in the borough offer sixth form facilities, while several others did so until the beginning of the 1990s when the local authority decided to concentrate post-16 education in further education colleges. Since the University of Wolverhampton closed its Dudley campus in 2002, the metropolitan borough is the largest district in the UK without its own university. Dudley MBC maintains 78 primary schools (39 include nursery facilities), 20 secondary schools, and 7 special schools, along with 3 Pupil Referral Units and 1 standalone nursery school. Pupils transfer to secondary school at the age of 11, although between 1972 and 1990 pupils in the north of borough transferred to secondary school at the age of 12, and from 1972 to 1982 there was a three-tier education system in Halesowen where pupils entered first school at 5, middle school at 9 and secondary school at 13. The borough had well over 30 secondary schools on its creation, although this was quickly reduced as a result of the introduction of the comprehensive system a year later, which resulted in a number of schools being merged or closed. By September 1990, however, the number of secondary schools in the borough had fallen to 22 as a result of the closure of Gilbert Claughton and Mons Hill Schools and the merger of High Park and Longlands Schools in Stourbridge to form Ridgewood High. A year earlier, Castle High had been formed in the town centre of Dudley from a merger of The Dudley School and Blue Coat School; this new school also took in some of the former Gilbert Claughton and Mons Hill pupils. The 1980s had also seen the closure of some the borough's less popular and smaller primary schools, with the older buildings mostly being demolished and the more modern ones being converted for community use. The closure of Cradley High School in Halesowen in July 2008 saw the number of secondary schools in the borough fall to 21, and the total has remained at 20 since the closure of Pensnett High School in July 2012. When the Metropolitan Borough of Dudley was formed, many primary schools were existed as separate infant and junior or first and middle schools, but by 1990 virtually all of the separate schools had been merged to create full circle primary schools, the last separate infant and junior schools to merge being Red Hall in Lower Gornal in January 1997. There are no grammar schools in the borough, with all state schools being comprehensive, a system which has been universal in the borough since the mid-1970s. The Former grammar schools in the borough were Dudley's Boys Grammar and Girls High Schools (merged with Park Secondary Modern School in 1975 to form The Dudley School, which in turn merged with The Blue Coat School to form Castle High in 1989), Sir Gilbert Claughton Grammar School in Dudley (which adopted comprehensive status in 1975 before closing in 1990), Brierley Hill Grammar School (actually situated in Kingswinford; it has been known as the Crestwood School since adopting comprehensive status), King Edward VI Boys Grammar School in Stourbridge (which is now a mixed sixth form college), Stourbridge Girls High School (which merged with the Boys Grammar School and Valley Road Secondary Modern School to form Redhill School), Halesowen Grammar School (which merged with Halesowen Technical School to form Earls High School) and High Arcal Grammar School in Sedgley (which survives as a comprehensive school). The sole independent school in the borough is the Elmfield Rudolf Steiner School in Stourbridge, which follows the Steiner Waldorf curriculum. The Old Swinford Hospital school in Stourbridge is one of only 34 state-funded boarding schools in England, with education being funded by the local education authority (LEA). The main NHS hospital serving the borough is Russells Hall Hospital, situated to the south of Dudley town centre. Following a major expansion of the hospital in 2005, all inpatient services were transferred to the site from smaller hospitals around the borough, resulting in the closure of Wordsley Hospital, and the downgrading of the Guest Hospital and Corbett hospitals into outpatient centres. Psychiatric care is offered at the Bushey Fields Hospital, located adjacent to Russells Hall Hospital. ^ "DMBC - Mayor of Dudley". Dudley Metropolitan Borough Council. Dudley Metropolitan Borough Council. Retrieved 11 May 2016. ^ "NUTS 2010". NUTS by regional level. Eurostat. Retrieved 14 February 2012. ^ "Dudley CB/MB through time". Vision of Britain. Retrieved 22 July 2012. ^ "Stourbridge UD/MB through time". Vision of Britain. Retrieved 22 July 2012. ^ "Halesowen UD/MB through time". Vision of Britain. Retrieved 22 July 2012. ^ "Dudley council election results: Full Breakdown". Express & Star. 6 May 2016. Retrieved 11 May 2016. ^ "Borough Wards". Dudley Councillors Online. Archived from the original on 4 February 2012. Retrieved 11 February 2012. ^ "Amblecote (Ward) - Population Density". Neighbourhood Statistics. ONS. Retrieved 21 February 2013. ^ "Belle Vale (Ward) - Population Density". Neighbourhood Statistics. ONS. Retrieved 21 February 2013. ^ "Brierley Hill (Ward) - Population Density". Neighbourhood Statistics. ONS. Retrieved 21 February 2013. ^ "Brockmoor and Pensnett (Ward) - Population Density". Neighbourhood Statistics. ONS. Retrieved 21 February 2013. ^ "Castle and Priory (Ward) - Population Density". Neighbourhood Statistics. ONS. Retrieved 21 February 2013. ^ "Coseley East (Ward) - Population Density". Neighbourhood Statistics. ONS. Retrieved 21 February 2013. ^ "Cradley and Wollescote (Ward) - Population Density". Neighbourhood Statistics. ONS. Retrieved 21 February 2013. ^ "Gornal (Ward) - Population Density". Neighbourhood Statistics. ONS. Retrieved 21 February 2013. ^ "Halesowen North (Ward) - Population Density". Neighbourhood Statistics. ONS. Retrieved 21 February 2013. ^ "Halesowen South (Ward) - Population Density". Neighbourhood Statistics. ONS. Retrieved 21 February 2013. ^ "Hayley Green and Cradley South (Ward) - Population Density". Neighbourhood Statistics. ONS. Retrieved 21 February 2013. ^ "Kingswinford North and Wall Heath (Ward) - Population Density". Neighbourhood Statistics. ONS. Retrieved 21 February 2013. ^ "Kingswinford South (Ward) - Population Density". Neighbourhood Statistics. ONS. Retrieved 21 February 2013. ^ "Lye and Stourbridge North (Ward) - Population Density". Neighbourhood Statistics. ONS. Retrieved 21 February 2013. ^ "Netherton, Woods and St Andrews (Ward) - Population Density". Neighbourhood Statistics. ONS. Retrieved 21 February 2013. ^ "Norton (Ward) - Population Density". Neighbourhood Statistics. ONS. Retrieved 21 February 2013. ^ "Pedmore and Stourbridge East (Ward) - Population Density". Neighbourhood Statistics. ONS. Retrieved 21 February 2013. ^ "Quarry Bank and Dudley Wood (Ward) - Population Density". Neighbourhood Statistics. ONS. Retrieved 21 February 2013. ^ "St James's (Ward) - Population Density". Neighbourhood Statistics. ONS. Retrieved 21 February 2013. ^ "St Thomas's (Ward) - Population Density". Neighbourhood Statistics. ONS. Retrieved 21 February 2013. ^ "Sedgley (Ward) - Population Density". Neighbourhood Statistics. ONS. Retrieved 21 February 2013. ^ "Upper Gornal and Woodsetton (Ward) - Population Density". Neighbourhood Statistics. ONS. Retrieved 21 February 2013. ^ "Wollaston and Stourbridge Town (Ward) - Population Density". Neighbourhood Statistics. ONS. Retrieved 21 February 2013. ^ "Wordsley (Ward) - Population Density". Neighbourhood Statistics. ONS. Retrieved 21 February 2013. ^ a b "Dudley (Local Authority) - Population Density". Neighbourhood Statistics. ONS. Retrieved 21 February 2013. ^ a b "Dudley (Local Authority) - Resident Population Estimates by Ethnic Group". Neighbourhood Statistics. ONS. Retrieved 21 February 2013. ^ "Borough Level Statistics - Census 2001". Dudley MBC. Retrieved 14 February 2012. ^ a b "Dudley (Local Authority) - Religion 2011". Neighbourhood Statistics. ONS. Retrieved 21 February 2013. ^ "Dudley (Local Authority) - Economic Activity". Neighbourhood Statistics. ONS. Retrieved 21 February 2013. ^ a b c "Labour Market Profile - Dudley". nomis - Official Labour Market Statistics. Retrieved 4 August 2012. ^ "Visitor Figures for Attractions in Dudley 2015". ^ "Property Portfolio - Merry Hill". Westfield Group. Archived from the original on 26 June 2012. Retrieved 4 August 2012. ^ "Contact Archived 1 March 2012 at the Wayback Machine." JCDecaux UK. Retrieved on 28 September 2011. "JCDecaux - Birmingham 209-215 Long Lane Halesowen, West Midlands Birmingham, B62 9JT"
^ "About King Edward's: History". King Edward VI College. Archived from the original on 25 January 2014. Retrieved 27 July 2012. ^ "Campaign to bring a university to Dudley". Dudley News. 17 March 2008. Retrieved 27 July 2012. ^ "School Information". Education and Learning. Dudley MBC. Retrieved 27 July 2012. ^ "About Us". Elmfield Rudolf Steiner School. Retrieved 27 July 2012. ^ "About the school". Old Swinford Hospital. Archived from the original on 28 July 2012. Retrieved 27 July 2012.